Why risk yourself and your company to costly fines if you can get cheap stock photos? While free photos are quite seductive, do not succumb to temptation. You can get cheap stock images in a number of agencies. 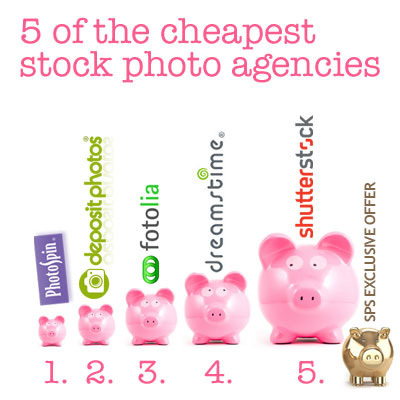 Below is the list of the biggest and the best cheap stock photo sites in the market. All of them offer royalty-free images for less than 10 dollars. You can even get them for 1 dollar if you only require website-sized images. A subscription only site, Shutterstock is not the agency for occasional buyers. It is suitable for individuals who require large amounts of cheap photos on a daily basis. Most photographers and artists submit their work to Shutterstock hence the website’s over 60 million creative files. If you are part of a large design agency that uses images for presentations and mock ups, then this website is for you. Known as the undisputed king of microstock photography, iStock has higher standards compared to other cheap stock photo sites. If you are searching for large, high quality, high resolution photos for print, iStock photos are suitable – especially when viewed in full size. The stock photo site also has its own photographers, who provide exclusive stock photos cheap only found in the website. While they may be more expensive than other microstock agencies, their browsing and zooming facilities are the best in the industry. Of the bigger stock photo sites, BigStock is the most easy-going when it comes to submissions – meaning you can also find images not available in other websites. If you do not require cheap stock images for print, you can go well with BigStock. The website does not have zooming facilities, which is fine if the images are for web use. Moreover, it offers less expensive higher resolution images than other bigger stock agencies, saving you a few dollars. When it comes to browsing and zooming facilities, Fotolia comes second to iStock. The website also offers cheaper stock photos, making it a good source of microstock materials. It is a favorite among European designers; thus, browsing through their best sellers may produce slightly different results. It is also less complicated when it comes to submissions. That is why images not suitable for iStock and Shutterstock can be found in the library. The zooming facilities of the cheap stock photo site make the cheap photos meet your requirements.